Am I An HR Or An IR manager? | Business Article | MBA Skool-Study.Learn.Share. Am I An HR Or An IR manager? Is this a question that has been bugging you recently? Let us start by trying to find out how we differentiate these two approaches management, namely- Human Resourse Management and Industrial Relations Management. Some answers that come to my mind and probably readers mind as well are that Industrial Relations (referred to as IR henceforth) approach is related to ‘blue collar’ jobs whereas Human Resource (referred to as HR henceforth) approach is more relevant for office going ‘white collar’ employees. Another could be that IR is for manufacturing industry workers and HR for their management and for the service industry. Another rather unique perspective is that HR is all about set of rules and procedures (formulation and implementation) and IR on the other hand has comparatively less structure so to speak. No one can teach the best way to talk to a union leader or negotiate in a wage negotiation. All these definitions in their own merit do make some sense. Let’s talk of ‘blue collared’ v/s ‘white collared’ argument. In these changing times of technology and innovation, is it possible to categorize all jobs into these two categories. The boundaries are blurring. This and other responses that initially came to mind are more of coming from the ‘apparent’ application of these two approaches rather than the hitting on the ‘basis’ of the application of these two approaches. Is there something in common in all the arguments discussed above that we are probably missing? The basis of these two approaches proposed here is that of power to market the skills in possession of the employee that helps the choice of approach to be followed for his/her management. Is there a demand of the skills in the possession of the employee which the competitors may like to have at a higher value than the employee is getting here? Does the employee have enough power to market those skills? It is not dependent on which colour of collar you are in (defining these terms has become more and more difficult) nor on the type of industry you are working in. To one’s amazement, it is also not dependent on where in the hierarchy inside the organisation you reside be it at the higher levels of management or lower ones. An employee can be‘managed’ through either of the approaches of management dependent on the factor of marketability of his/her skills and the employee’s power to do so. (When we are talking about power, we are referring to individual power and not collectivized power) Let us now state the basis of selection and application of these two approaches explicitly for better understanding viz.High power to market and Low power to market. The factor that plays an important role in determining the employee’s power to market the skills other than the actual difficulty of the skill (does that matter is left as a food for thought) is External Environment. It directly influences the management who is in charge of using these approaches to manage the human capital. External sub-factors like Macroeconomic indicators (GDP growth, unemployment etc.) force the management to change the way they approach the whole concept of managing personnel. This is again indicated that this factor is not outside the hypothesis being proposed above. 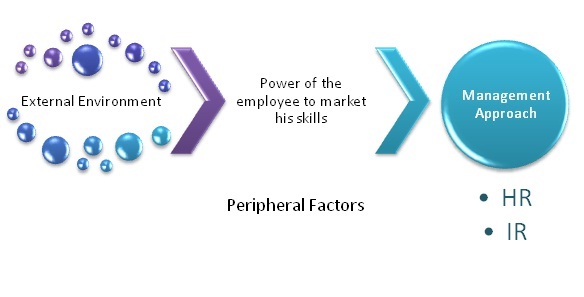 All the factors in turn affect the ‘power’ of the employee to market his/her skills. Knowing what approach works well for your context and the employee or group of employees in question is of utmost importance. The answer to the question of how to nurture and retain talent has to be answered with layer consisting of a number of varying and eclectic perspectives. This article is s humble attempt towards the same. This article has been authored by Honeydeep Singh Sabharwal from XLRI.